We’ve all seen those memes and read those tweets ridiculing the liberal arts, basking in STEM major egotism. As many prospective students may know/have read, the University of Rochester curriculum has students pursue clusters in all three areas of study: social sciences, humanities, and natural sciences. Hence, one can take advantage of the curriculum in so far as they take a couple of classes here and there that fulfill these requirements. 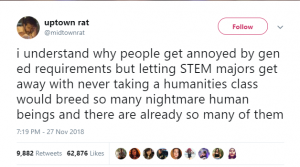 In the past three years, I’ve heard several students, particularly STEM-oriented students, question the existence of these cluster requirements. A student studies blister beetle population levels in Mt. 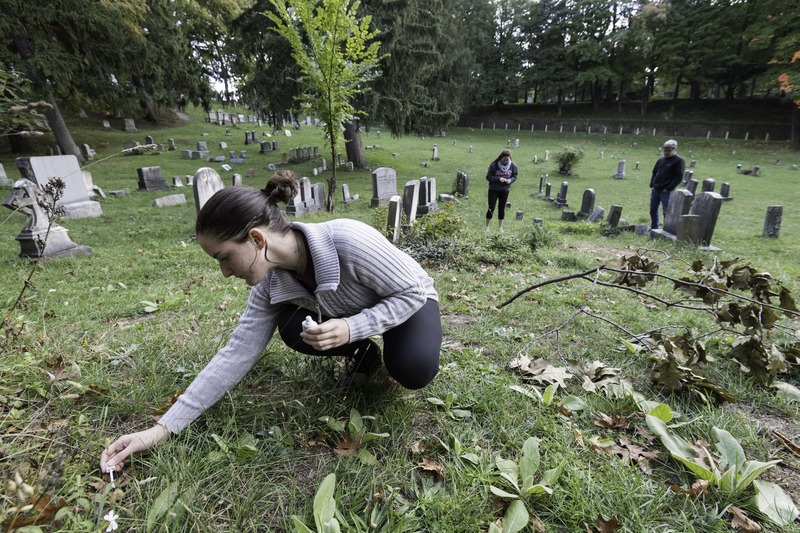 Hope Cemetery as part of her ecology and environment class. How would I as a STEM major ever benefit from taking classes in the humanities? Now, for starters, I am a humanities major. But I am also a STEM major as well as a social sciences major. I have triple majors in film and media studies (humanities), anthropology (social sciences) and computer science (natural sciences). And there’s a reason for that. 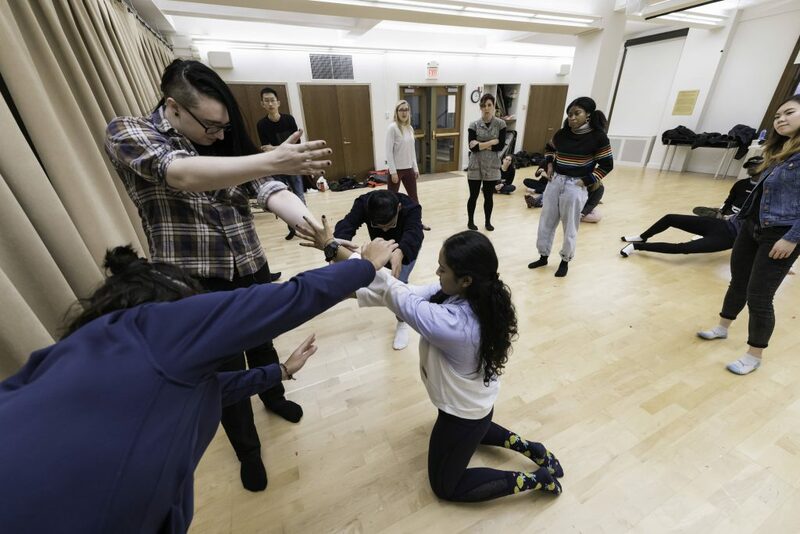 Students depict accessibility in their Arts in Action dance class, joined by students from an Environmental Health and Justice class in a multidisciplinary engagement joint class session on Theater of the Oppressed as a vehicle for community organization, expression, and action about a range of social justice issues. Theory and knowledge derived from the social sciences and humanities are prerequisites to all applications of the natural science. How do you become a renowned doctor if you do not understand cross-cultural differences that may arise and result in complications in the patients you are working with? For instance, families that reside in South Asia may turn to ayurvedic medicinal approaches before turning to Western medicine. Dietary patterns and religion are also key to understanding one’s lifestyle. Most importantly, the United States has a prolonged history of anti-blackness that has affected one’s approach and characterizations/conceptualizations of disease, such as Schizophrenia and HIV/AIDs. In my own subject area, computer science, the handling and processing of Big Data is becoming a more and more pressing subject. When we “filter” data and “utilize” data, we need to consider 1) Where is this data coming from? 2) What biases are present within this data? 3) How are we using this data and what types of populations are being hypersurveilled? Facebook serves as a prime example of this “data gone wrong” scenario. Another point of tension is this illusion that humanity courses are extremely easy (personally, I like to #flexxx at hard-core STEM kids with my humanities courses). Yes, some humanities courses are easy. Yes, some humanities courses are easy to get As in. Yet, I would say the same for a lot STEM courses. The answer is simple: it’s really about what course you take and the amount of effort you put into the subject. Critical race, gender, and class theory cannot be learned overnight. Whether it’s Moten, Benjamin, Baudrillard, or Butler, I can assure you these theories take an exceeding amount of time to digest and comprehend. At most, maybe an argument could be made for a particular major, where all classes are difficult, but even with that argument, I would have to say that’s discretionary to the person taking those classes. If you lack a strong mathematical foundation, then STEM may be much harder for you. 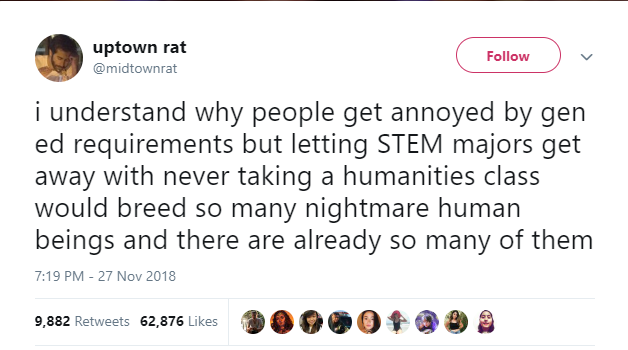 However, if you are an international student from a country where STEM was emphasized in school curriculum, the humanities will be much more difficult for you. Am I salty? Ehhh… one could say. Am I salty that being a STEM major gives me a more weighted opinion on this subject? Yeah, probably. So what does this all mean? Take humanities courses! Go outside of your interests! Make room in your schedule! Any final thoughts? Yes, just one: this tweet. Satisfactory Academic Progress: What Is It and Why Should I Care?